In Justice and Reconciliation in World Politics, Catherine Lu examines a foundational question in international ethics: namely, how should we respond to political catastrophes, most particularly the legacies of colonial injustice? The book offers a fresh perspective on global justice, responsibility and reconciliation, writes Marija Antanaviciute, that orients attention from an emphasis on individual accountability to explore strategies for addressing international structural injustice. This review is part of a theme week published in the run-up to International Women’s Day 2019 (#IWD2019) to celebrate women’s scholarship across the social sciences and humanities. You can explore more of the week’s content here. 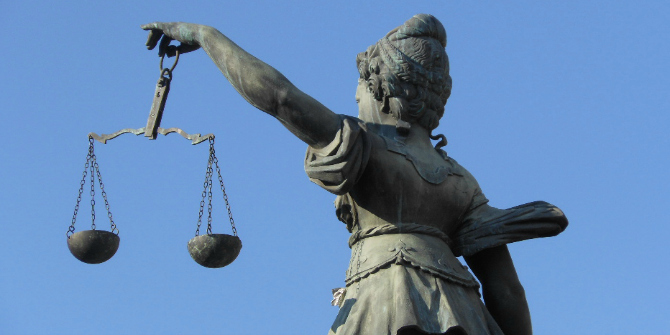 Justice and Reconciliation in World Politics. Catherine Lu. Cambridge University Press. 2017. ‘What evil slavery breeds! Once conquered by violence, one must endure injustice.’ Justice and Reconciliation in World Politics starts with a quote from Euripides’s Hecuba, perfectly capturing the enduring legacies of political wrongdoings. 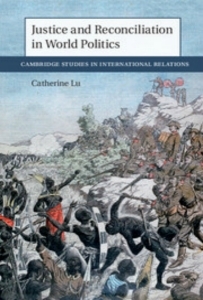 In the book Catherine Lu, whose previous work has focused on just interventions, addresses one of the foundational questions in international ethics: how should the world respond to political catastrophes, particularly colonial injustices? Justice and Reconciliation in World Politics offers a fresh perspective on the practice of global justice and puts forward an argument for decolonisation, decentring and disalienation as strategies to address structural injustices. These strategies go beyond individual interactional practices of accountability and challenge the statist world order in doing so. At the centre of the book lies a question about the practices of reconciliation that are responding to international structural injustices. Throughout the argument, Lu draws on Iris Marion Young’s conceptions of responsibility and a number of historical cases of injustices, from the Japanese military ‘comfort system’ to the experiences of Indigenous peoples in Canada. Two key contributions that this book brings to the debates of international justice can be singled out. Firstly, Lu restates the relationship between justice and reconciliation through developing a distinction between interactional and structural justice. Secondly, following this, she restates the concept and practice of responsibility for present and past structural injustices in the context of colonialism. The theoretical basis for the argument is drawn from reconsidering the conventional view of the Versailles peace process of 1919. It challenges the conventional realist claim that the requirements of justice are counterproductive for, and at odds with those of, reconciliation. The two concepts, according to Lu, are analytically distinct and cannot be reduced to one another. To facilitate better understanding of the distinction, she introduces two ways – interactional and structural – to conceptualise justice and reconciliation. The former refers to what is conventionally understood as justice: settling accounts for wrongdoing between agents, drawing a clear line between perpetrators and victims. It is a rather calculative exercise, the act of balancing the moral books of suffering and harm. But justice, Lu argues, is more than that. We need to widen our understanding to include structural injustices: institutions, norms, practices and material conditions that have had a causal relationship with unjust outcomes or acts. Justice should not be limited to interactions, but should also extend to agents’ affirmation of and participation in relevant political and social structures that generate inequalities. Lu uses this distinction throughout the book to reflect on issues of victimhood, reconciliation and reparations. While the author highlights that these two types of justice are complimentary rather than mutually exclusive, it is not entirely clear if there is more to structural justice than the overall social and historical conditions at any given time. Having said that, there are important limitations to the interactional model of settling accounts. The existing practice of interactional justice, claims Lu, is not capable of adequately addressing the complexity of postcolonial injustices. The processes designed to settle accounts for international political catastrophes, namely, ad-hoc tribunals and the International Criminal Court (ICC), operate under the assumption of a well-ordered global system with a legitimate authority capable of punishing wrongdoers. Such an approach is not only ineffective in a global system defined by its colonial legacies, but also, and importantly, instead of addressing entrenched status hierarchies, it reproduces them and obscures the structural conditions of wrongful acts. Instead of focusing on individual responsibility, practices of international criminal law need to recognise the importance of political responsibility for structural aspects of international catastrophes. Lu calls for a different type of conflict resolution that would go beyond an individual liability model to recognise international wrongdoing as the product of agents acting within unjust social and political structures. The second significant contribution of the book springs from reconsidering responsibility for structural injustices and the reconciliation that follows. Actors participating in and affirming a system that is either inherently unjust or has been unjustly created bear responsibility for the wider historical and ongoing wrongdoings that have been facilitated by such a system. This has consequences on the process of reconciliation after political catastrophes. Lu provides an interesting perspective on reconciliation, dissecting it through both the interactional and structural alienation that it creates. The state-centric interactional approach disregards responsibility and the contribution to injustice on the part of international society, unjust structural arrangements and groups within colonised peoples themselves. Importantly, treating colonial injustices as the product of structural injustices challenges the prevailing conception of an anarchical international order. By recognising structural injustices, we recognise the hierarchical order of global politics. Subsequently, the author considers the structural nature of the Japanese military’s ‘comfort system’ during the Asia-Pacific war in the context of Japanese colonialism in Korea (1910-45). Lu problematises colonial injustices as structural within both Korean and Japanese societies, showing that colonisers and colonised do not fall neatly into the roles of perpetrators and victims. Meaningful reconciliation is considered from the point of multiple alienations. International society needs to recognise not only the alienation of victims from perpetrators, but also from the state structure itself that enabled the wrongdoing in the first place. It also needs to address existential reconciliation, particularly in the context of colonial practices and the construction of colonial identities. The case of German colonial practices in German South West Africa is considered to show how ‘precolonial people may experience structural alienation when forced into sovereign state and interstate systems that do not recognise their status as peoples’ and that do not recognise their particular experience of colonialism. Or, in the instance of the historical experiences of Indigenous peoples in Canada, colonialism can create existential alienation by forcing Indigenous peoples to lead inauthentic lives and construct inauthentic agency. This makes reconciliation a next-to-impossible project as potentially nothing in the postcolonial process can be claimed as an expression of authentic political agency. Decolonisation does not necessarily lead to self-realisation and colonised groups might never get their authentic agency back. However, Lu concludes by offering three practical strategies to bring about a shift in the way agents see their own joint responsibility: decolonise, decentre and disalienate. For Lu, these three strategies would offer a chance for international actors to become fully aware of their responsibilities for structural injustices and would serve as a step towards creating ‘mutually affirmable and affirmed social and political orders for nonalienated human flourishing’. In order to achieve it, the marginalisation of non-European modes of knowledge and discourses needs to be repudiated. Political institutions and power centres need to be decentred, together with narratives about human experiences and practices. Lastly, in order to create genuine communication that would facilitate reconciliation, the capacity for authentic agency on the part of those marginalised needs to be built up. These strategies will support the creation of an international order that enables marginalised participants to join political conversation as equals. Justice and Reconciliation in World Politics challenges the conventional understanding of an anarchical world order. By providing a strong case for colonial injustices as an outcome of global structural injustices, it develops an understanding of the world order that has long-lasting structuring effects on state and non-state actors. She calls for new tools to address structural injustices in global politics, not least the transformation of the ICC. The book invites both readers and international actors to reflect on their joint responsibilities when participating in structures that reproduce conditions and practices that enable further wrongdoing. It is indeed an ambitious yet necessary goal that would have a radical transformative effect on the global order.